Emmaus Evangelical Lutheran Church was founded as The First Scandinavian Lutheran Church of Racine on August 22, 1851 in the home of John Lawson for the purpose of building a church where Norwegian and Danish Lutheran immigrants to southeastern Wisconsin could worship God in their own language. A building committee consisting of Larson, John S. Bangs, and Andrew Johnson selected a site just north of the Root River near the current intersection of State Street and Marquette Avenue. The blacksmith shop pictured above is thought to have been a later occupant of the original church building. The congregation’s first pastor was Rev. Ole Andrewson (pictured at left), a preacher who also served congregations in Milwaukee and Muskego (present-day Atonement Lutheran Church), from 1851 to 1853. The first recorded baptism at First Scandinavian Lutheran Church was of William Ronne (recorded as “Weliom Rone”), born November 6, 1851, baptized November 24, son of Kjel and Elisa Ronne.The congregation was made up of poor immigrants, who had difficulty making payments on the mortgage of their young church. The property was forfeited in 1860, and it took until August 10, 1863 before the congregation was organized anew. The reorganization meeting was held in the home of Finkel Finkelsen and presided over by Rev. Andrewson. Congregational leaders voted to adopt the ritual of the Norwegian Lutheran Church, and Rev. 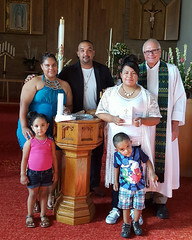 Andrewson agreed to serve the congregation until its first resident pastor, Rev. Johan Peter Gjertsen, 61, was called in 1864. The membership may have been poor, but by no means did they lack strong opinions or a habit of getting into heated, contentious arguments with each other and with their pastors. During Gjertsen’s tenure, the church council stripped Henrik Madsen of the title of deacon because he had become a saloon keeper in direct violation of the church constitution. Member M. Thorkildsen was expelled from the congregation after accusing Rev. Gjertsen of profanity. Finkel Finkelsen was expelled as a result of continuous feuding with Gjertsen, precipitating a crisis that was resolved only by Gjertsen’s removal in 1867. Gjertsen would go on in 1878 to found the Zion Society for Israel, an organization dedicated to “work for the conversion and salvation of Israel,” a highly controversial idea even back then. Gjertsen was succeeded at Emmaus by Rev. Johannes Muller-Eggen, 26, pastor from 1878 to 1871. Muller-Eggen was succeeded in 1871 by a young Danish missionary from Africa, Rev. Adam Dan, 23 (pictured at right). Where there had been division during the pastorate of J. P. Gjertsen, there was outright schism when the idealistic Dan’s “Grundtvigian” emphasis on the Apostles’ Creed as the foundation of Christian faith shocked and offended those who believed that he was belittling the importance of biblical scripture. The adoption of a new constitution including the sentence “We know of but one true Christian faith unto Salvation, namely that in which we are baptized, and which we confess in the Apostles’ Creed” prompted the anti-Dan faction to summon a group of Norwegian-American pastors to denounce their pastor. A pro-Dan majority on the council denied the visiting pastors the floor. As each faction sought to expel the other from membership in the church, the dispute wound up in Racine County court, where the anti-Dan faction sued to have Dan declared a heretic and the church property declared rightfully their own. Rev. Andrewson was among the Norwegian pastors who appeared to testify, through an interpreter, against Rev. Dan. Dan’s case was hampered by the absence of a capable translator; in the end, the court decided that Dan was guilty of unLutheran doctrine, but that the property should remain in the hands of the majority of the congregation. 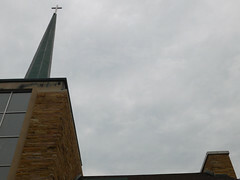 Many of the congregation’s Norwegian and some of its Danish members split away at this time to form Bethesda Lutheran Church (which merged with Immanuel Lutheran Church in 1968 to form Lutheran Church of the Resurrection). Still, Dan’s charismatic and vibrant leadership led the congregation to build a new, bigger church building on Chippecotton Street (now Mound Avenue). The church building was dedicated on January 27, 1878. 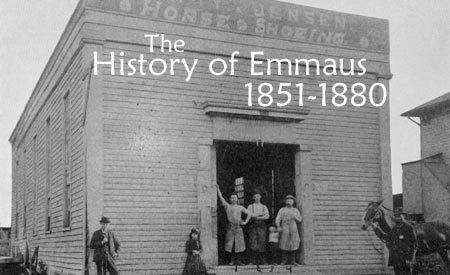 The name “Emaus” had been informally adopted two years earlier, but would not become the legal name of the congregation until 1923. Adam Dan was a principal figure in the creation of the Danish American Lutheran Church in 1872. During that year, he also established St. Mary’s Lutheran Church in Kenosha, Wisconsin, and Trinity Lutheran Church in Chicago, Illinois. After leaving Racine, he founded churches in California. While the Norwegian Synod continued to regard his views as unLutheran, Rev. Dan was a prolific hymn writer and a frequent contributor to Danish-American religious journals and the founder of Kirkelig Samler, the Danish American Lutheran Church’s first newspaper. (Later photos of Rev. Dan appear on the history page of Fredsville Lutheran Church of Cedar Falls, Iowa; see also the ELCA Archive’s biography page of Adam Dan). I am searching for my great uncle, Christian Jensen, he was a clergyman listed in the 1920 census of Racine, Wisconsin. He came from Denmark around 1893, and lived in your city for some time. I was inquiring to see if he was a minister in your church about the 1920’s. I appreciate any help you can give me. Thank you so much. Mrs. Sharon A. Hitchcock.